Before going through domain registration process and comparison among popular domain registrars, I want to answer two frequent questions. 1) what is Domain name? 2) What’s the role of domain name and how it is important for a website? A Domain name is nothing but a unique URL of your website. URL (Uniform resource locator) is a string, which user enters into the browser to visit the website. For example www.easysteps2buildwebsite.com is a domain name for my website. What’s the role of domain name and how it is important for a website? Let me explain this with an example. Suppose you search a keyword on Google and get bulk of search results. Which result will you open first? Of course the one which has domain name, relevant to your search content. It is very important to choose domain name according your content, it must complements your content and should be easy to memorize. It can be long or short, doesn’t matter. If we go by arguments over internet, some says big domain names are good, other says short ones are good. As per my understanding both types are good, provided, it should make sense and should complement your content. Now you must be thinking, which domain registrar (Domain registrar is the one, which has rights to sell domain name) you should choose for domain registration. 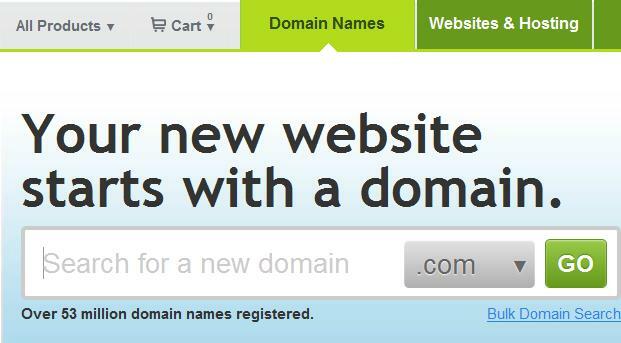 How to register domain name for your website?? There are many domain registrars available. You can read my post best domain name registrar to find the best domain registrar for you. One of the best domain registrar is GoDaddy.com. The following steps will show you the process with GoDaddy.com. It typically requires couple of minutes to complete. 2) Enter your desired domain name into the search box and press “Go”. It will show you whether the domain name you have entered is available or not. Also it shows similar domain names, which you can choose as an alternative, if the domain name you choosed is existing( not available). For example I gave “build website” into the search box and pressed GO and I got message that buildwebsite.com is already taken and it displayed some of the alternates. You can try again, for different domain name or you can choose the domain name, out of the suggested domain names by Godaddy. 3) Choose a domain name from the list, by clicking the “ADD”. Then click on continue registration button to proceed with registration process. 4) The next page in the domain registration process will prompt you for information, such as your contact information, registration length, user-id/Password and payment information. Fill out the information and choose the desired billing cycle. Complete the registration process, after completion you will be receiving an email receipt for order completion. The receipt will be having your order number and user-ID. 5) After completion of step4, domain registration process is complete. GoDaddy.com will complete your registration within 24 hours and you will be receiving the confirmation e-mail for the same. If you still have any doubt or questions regarding this, then leave a comment below or contact to me through contact-us form. I would love to answer those. If you liked the post and want to stay in touch then you can join us on Gplus and facebook. you can also subscribe for free e-mail updates.